In the 19th century, the world was Europeanised. In the 20th century, it was Americanised. Now, in the 21st century, the world is being irreversibly Asianised. The “Asian Century” is even bigger than you think. Far greater than just China, the new Asian system taking shape is a multi-civilisational order spanning Saudi Arabia to Japan, and Russia to Australia — linking five billion people through trade, finance and infrastructure networks that together represent 40 percent of global GDP. China has taken a lead in building the new Silk Roads across Asia, but it will not lead it alone. Rather, Asia is returning to the stable multipolar order that existed long before European colonialism and American dominance, with India and Southeast Asia coming into their own as economic and strategic hubs. Large but dormant societies from Iran to Indonesia are finally emerging, teeming with young and urban, ambitious and entrepreneurial youth, while from Saudi Arabia to Vietnam, privatisation is unlocking a new wave of growth. Asians are sharing economic and governance models as never before, and their confident outward push is reshaping business and cultural life across North America and Europe, South America and Africa. From investment portfolios and trade wars to Hollywood movies and holiday travels, no aspect of life is immune from Asianisation. The world has become familiar to hearing “America First” — but is it ready for “Asia First”? What happens when Asia no longer produces for the West but when the West produces for Asia? And when Asians do not aspire to live like the West, but rather Western societies wish they had Asians’ stability and far-sighted leadership? Get ready to see the world, and the future, from the Asian point of view. Dr. Parag Khanna’s latest book The Future is Asian presents this irrepressible global Asianisation through detailed analysis, data and maps of Asia’s major markets and their combined impact on global economy, society and governance. 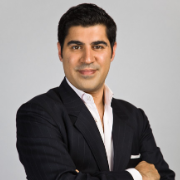 With his trademark conceptual clarity and on-the-ground reportage, Khanna provides essential guidance for executives as they look to hedge their China exposure and capture the next big commercial opportunities across Asia from real estate and retail to finance and technology, and attract Asian capital and talent into their operations at home and abroad. With his intimate knowledge of Asian history and geopolitics, he also paints a compelling vision of a balanced global system of shared responsibilities across America, Europe and Asia. Following on the heels of his pioneering trilogy that concluded with the revolutionary Connectography (2016), The Future is Asian will similarly serve as a global strategic roadmap for decades to come. YCW London is delighted to host Dr Khanna to discuss his latest book The Future is Asian. Copies of his book will be on sale at the event. In 2008, Parag was named one of Esquire’s “75 Most Influential People of the 21st Century”, and featured in WIRED magazine’s “Smart List.” He holds a PhD from the London School of Economics, in addition to Bachelors and Masters degrees from the School of Foreign Service at Georgetown University. He has traveled to more than 100 countries and is a Young Global Leader of the World Economic Forum.